The subject of the oil painting- Peasants by the Hearth, has long been debated, although we can be sure it is not simply a peasant scene. it was once believed to be a portrait of the artist's family, but that hypothesis was rejected some time ago. The scene has all the elements of a rural booze-up. Much drink is being consumed, sausages grilled and bacon fried. There are festive biscuits on the table and a tray of waffles. Crowns like the one worn by the boy were used on the Feast of Epiphany, but also during other winter festivities, including Shrove Tuesday. Neither holiday is being celebrated here, however. The bird-cage next to the door on the left tells us that the scene is taking place in a house of ill repute, such as a tavern or brothel. 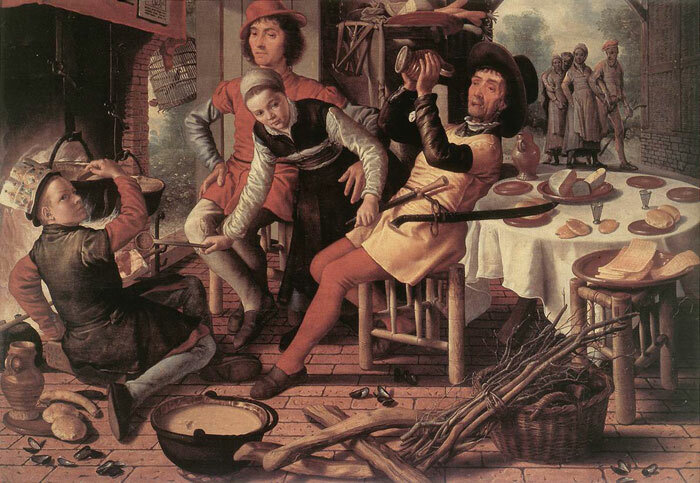 Other elements combine to suggest the latter - the way the young man places his arm around the girl's waist, the copious eating and drinking, the aggression symbolized by the man with the two weapons, and the foolishness reflected by the king's crown. Like many of Aertsen's paintings, this work has both a moralizing and admonitory content, revealed by the presence of three men of different ages, each symbolizing a generation, around one woman. SPECIAL NOTE : The painter will make the reproduction as close to the original oil painting as possible. If you want your painting to alter from this likeness, please email us and " Peasants by the Hearth, 1560 " will be reproduced according to your special requirements.